A handy, pocket-sized practice book that will help children to learn to spell even the most difficult words. 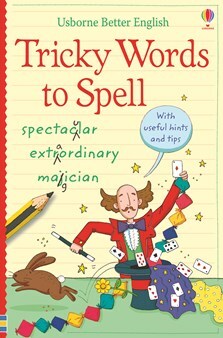 Includes 300 tricky words, such as embarrassing, extraordinary, politician, neither and exaggerate. Each page has three tricky words with similar spelling rules for children to learn, and space below to test themselves. With useful spelling rules and tips, a checklist of essential words to learn and Usborne Quicklinks to take children to specially selected websites including online spelling games and quizzes.